Pack a party with a durable duffel that features a cooler and pocket with grilling essentials. Some people pack their duffel with gym clothes. You prefer to pack a party. 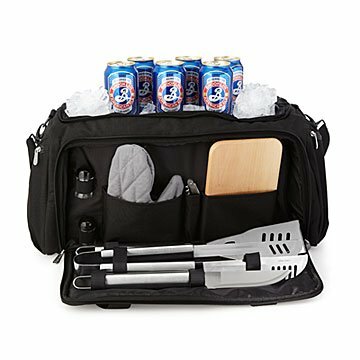 This durable bag ensures you travel efficiently to tailgate parties and picnics: The heat-sealed main compartment serves as a cooler and fits 46 12-ounce cans; the side pocket stores stainless steel grilling tools, cutting board, corkscrew, mitt, and salt and pepper shakers. Additional pockets mean your other essentials can come along for the ride, and an adjustable shoulder strap frees up your hands for other important items, like beach balls and babies. Made in China. This was a perfect fit for my boyfriend. We live on the third floor so it's hard to carry everything to the grill. Love this product. This was a great purchase. I have rarely seen such a product with a grill set along with a drink cooler. It works great and it has everything you would need to grill. This is perfect for tailgating. We always seem to forget something so having everything have its own spot in this bag makes things so much easier! And since it is more like a duffel bag it is light and easy to fit in the car with all the other things we pack.